Our entire home is painted the same neutral color.... although I don't think it is truly, truly neutral. I kept saying to myself and others the paint was too much of a yellow base and I wanted a cooler tone. But when I really got to looking at it, I realized it has a green base. Not pretty and definitely not neutral. 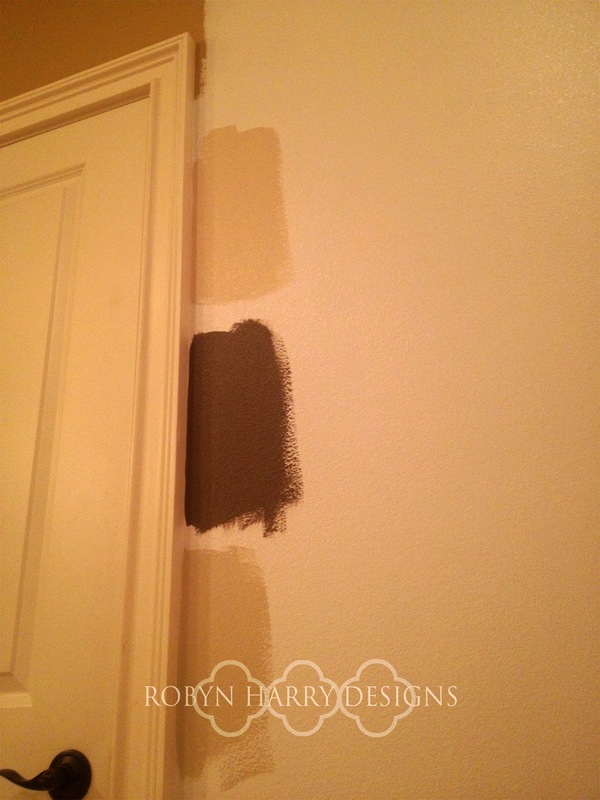 I've been leading a campaign in my home to update our paint color for a few months now. Unfortunately, the mayor of my town wasn't having it. 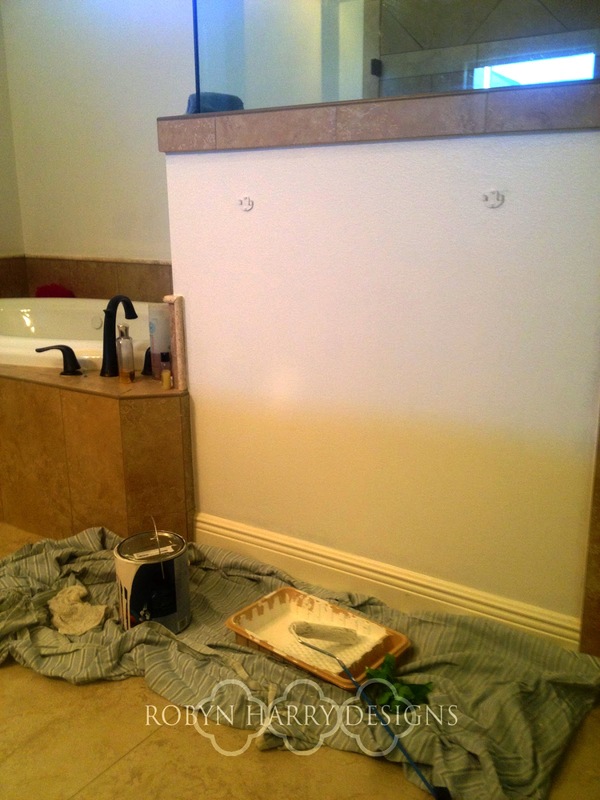 I finally convinced him to let me try out paint on our master bath. I am convinced when he sees how amazing it looks, he will let me do the rest of the house. I thought I wanted white. When I got it up on the walls, I hated it. 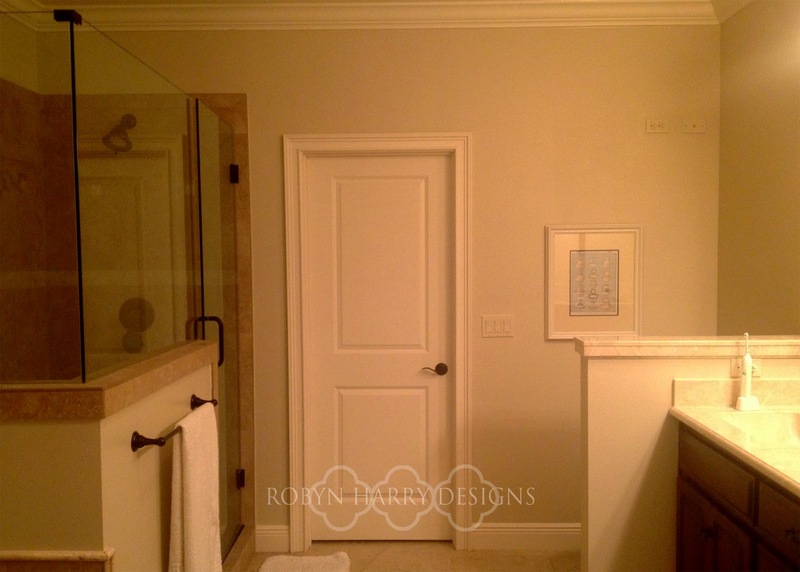 It just looked so stark against the creamy floorboards and the warm tile & marble. This is the part where I had to really evaluate the look I was going for. Why did I want white walls? How could I achieve what I really wanted? I knew I wanted a gray. As you can see, the tile and marble in my bathroom are very warm colors. So, I hopped on Pinterest and searched for warm grays. I analyzed grays all night and all morning. Then, I headed back to Lowes for more samples. When I got home, I painted several different colors on different parts in our bathroom where the light hits it differently. Once I the samples on the walls, it was an easy decision. I kicked myself repeatedly for not doing this the first time! 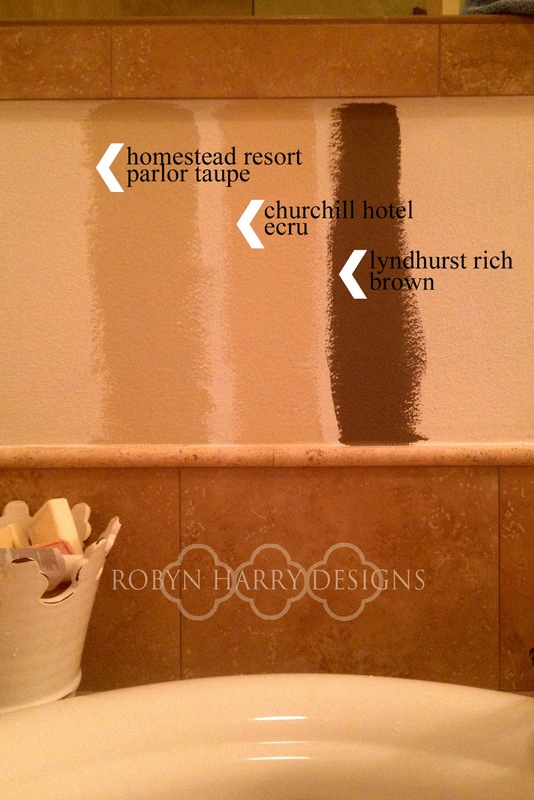 I went with Homestead Parlor Resort Taupe. It is a fantastic color from Valspar. 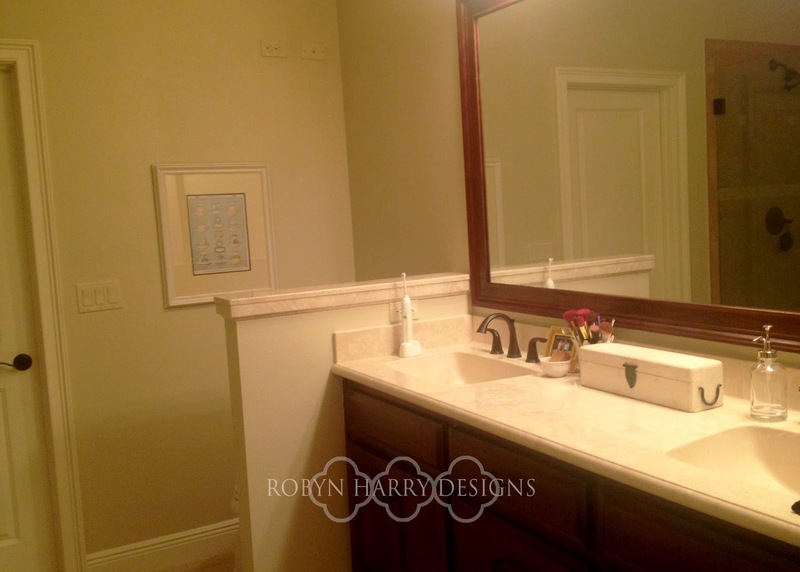 It looks warm and cream colored in certain lights and then a great gray in others. It is amazing what a difference half a gallon of paint can make!! Once the paint was done, I was beginning to see my vision for this room come together and I am so excited! 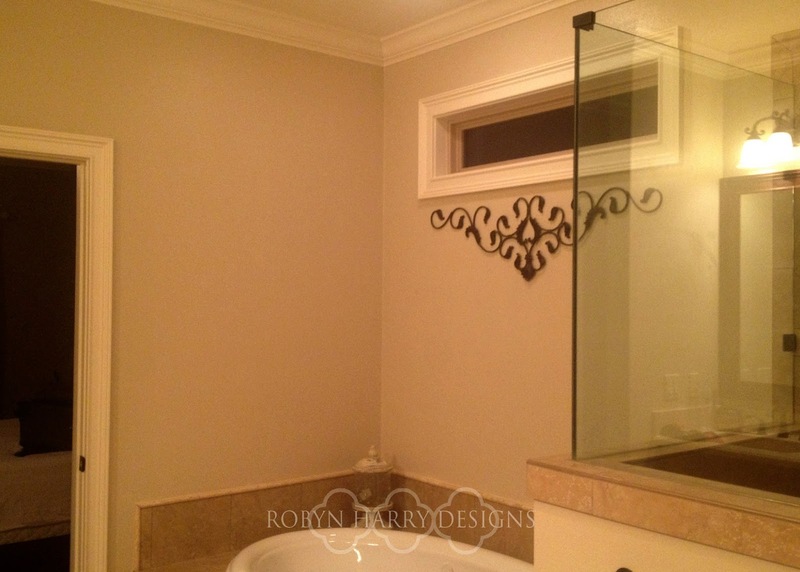 Next up I will be working on some new accessories, shelving and light fixtures. I hope you join me in the journey!